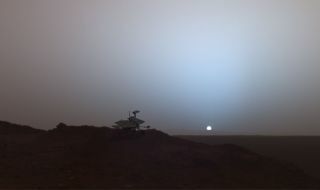 Ifyou ever wondered what it would be like to stand on Mars and view the nightsky, two robots have beat you wheels down. In "Backyard Astronomy from Mars" carried in the August issue of Sky &Telescope magazine (soon to hit newsstands), author Jim Bell details use ofthe Spirit and Opportunity Mars rovers to carry out nighttime observations. He isan astronomer and planetary scientist at Cornell University in Ithaca, New York, and is the leader of the Mars Exploration Rover Panoramic Camera (Pancam)team. Inthe article, Bell discusses astronomical sight-seeing utilizing Spirit, freshfrom a laborious trek up Husband Hill within the Columbia Hills at the robot'sGusev Crater exploration zone. Thanksto a dust devil blowing away particles that had fallen onto Spirit's solarpanels, the intrepid rover became power rich. "We had enough power to run therover's computer and cameras, and their associated heaters, at night," Bell explains. "Itwas an embarrassment of riches," Bell writes. "Several of us on the rover teamare astronomers, either professionals or amateurs, and we have always beenintrigued by the prospect of stargazing from the surface of another world." Admittedly, Bell relates, there were numbers of constraints using the robot--and a need tojustify use of a $400 million rover for astronomical observations. "It would bestone-knives and bear-skins backyard astronomy--but from Mars!" Despitethe obstacles, a set of novel astronomical observations were made using Spirit.For example, the two Mars moons--Phobos and Deimos--were pictured, with camerafilters applied to yield new data about the surface compositions of the redplanet's natural satellites. Starswith known brightnesses were also imaged, allowing researchers to look forevidence of nighttime dust or water-ice clouds wafting about in the thinmartian atmosphere. Longexposure takes by Spirit captured star trails. These images recorded linearstreaks, dots, and splotches created by cosmic rays striking the camera'ssensitive detectors. The observations can help validate meteor-showerpredictions, Bell says, giving scientists useful clues as to the rate ofimpacts of small meteoroids on the planet. "Finally,we obtained twilight-sky images from both Spirit and Opportunity," Bell writes. "These include some spectacular views of sunrises and sunsets - useful foranalyzing how dust is distributed vertically in the Martian atmosphere, but alsojust plain beautiful." Duringthe latter part of 2005, the Opportunity Mars rover on the other side of theplanet from Spirit caught Earth and Jupiter rising together before dawn in theeastern sky of Meridiani Planum. "Whatan amazing experience," Bell notes, "to be living on one planet and takingpictures of ourselves from the surface of another!" Asfor the future, Bell told SPACE.com via email that Mars scientists are mostlyworried about keeping Spirit and Opportunity alive through the coming martianwinter. "However,if we are fortunate enough to survive and continue to operate during a thirdmartian summer, we may be able to initiate new twilight or night-time astronomycampaigns on one or both vehicles," Bell explained. These observations couldprovide additional information on morning or evening clouds and atmosphericdynamics, or astrometric data to further refine the orbits of Phobos andDeimos, he said. Also,the rovers could be used to perform a longer, more sensitive search for meteorsin the martian atmosphere, Bell added, compared to the limited search that was performedin 2005. Furthermore,Bell said, additional information on the martian surface's harsh cosmic rayenvironment--which the rover camera system is very sensitive to during night-timeimaging observations -- could be used to help the imaging investigations on futuremissions like the upcoming NASA Phoenix lander and Mars Science Laboratorymissions...to help design more robust cameras or electronics. Checkout Sky and Telescope for more.